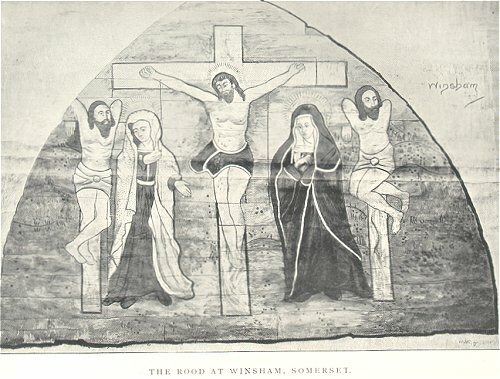 The paper entitled The Tympanum or the Rood Screen, as surviving at Winsham Church from which extracts are given below, was presented to the Somersetshire Archaeological and Natural History Societys visit to Chard in 1903, by Mr F.Bligh Bond, F.R.I.B.A, and was recorded in the Societys Proceedings. It came to my notice when a relative gave my wife a copy of the years proceedings in bound form, which he had found in a second hand bookshop for a few pence. It was the practice of the Society to select each year a different Somersetshire town in which to hold their annual meeting, and then stay for a few days to visit the local sites of interest. It is recorded that the Annual meeting was held in the Assembly Room of the George Hotel and well attended. Afterwards the gathering was entertained to luncheon at the Corn Exchange, nicely decorated for the occasion, by the Mayor and Corporation of Chard. The gathering numbered some 150. On the third day, so the account goes, "as the weather was favourable, and the number large", at 9.30 am they set out, passing through Forton to Leigh House, described as the beautiful Elizabethan residence of Mrs Savile, and belonging to Col. Henley. An interesting account of the visit was given, but I will not record the details here. The next stop was Winsham Church, where the Rev. D. H. Spencer acted as cicerone, and Mr Bligh Bond read the paper which is recorded here. Their further attention was drawn by the beautiful Chalice and the Solemn Protestation in one of the register books. After that it was off to Cricket St. Thomas and "luncheon was most hospitably provided at the Mansion by the President and Mrs Fry, who, with their daughter, Miss Norah L. Fry, extended a hearty welcome to every one". After lunch the members looked around the gardens and the returned to the house for tea and a short meeting to wind up the visit to Chard and the surrounding area. A group photograph was then taken on the front terrace. In closing, the meeting expressed the view that the trip they had enjoyed was one of the most successful ever organised. The Proceedings are an interesting record of more leisurely times, and an interesting example of lay scholarship. Below are extracts from the paper as relating to Winsham's Rood Screen. To see the complete transcript click here. The remarkable panel preserved in this church dates from a period not long anterior to the Reformation. The detail in the costume of the figures would indicate a date towards the close of the fifteenth century. The original position of the panel was at one time a subject of speculation, but comparison with other works of similar character which have come to light leads to the conclusion that this was without doubt the partition or 'Tympanum' which formerly surmounted the Rood-screed and divided Nave from Sanctuary. Until the restoration of the church in 1876, there was a ringers' gallery under the tower, with a floor at or near the level of the head of the screen, forming an unsightly obstruction in the church. The painted panel was used as a back to this gallery, and being disguised by accumulated coats of whitewash, the Vicar had it removed with other obstructions. But upon evidence of the existence of painting coming to light, it was carefully preserved, and is now secured to the north wall of the church under the tower, the screen being removed to the eastward. The panel has attracted the notice of local antiquaries, and a drawing was made of it some years ago, which was reproduced in Volume xxxvii of these Proceedings. More recently a fine facsimile copy in colour has been executed for Mr. F. F. Fox, Past President of the Gloucestershire Archaeological Society, who has devoted a good deal of attention to the subject in his very valuable Presidential Address on Roods and Rood-Lofts (Vol. xxiiii of their Transactions); and a photographic copy was given, which, by Mr. Fox's courtesy, I have the privilege of reproducing here. Readers are referred to Mr. Fox's paper for the expert artist's opinion on the painting and its condition. The Tympanum is the medieval substitute in the Western Church for the Veil of the Sanctuary, which the primitive church adopted from the Hebrew ritual. It has been shown by Bingham and others that the tripartite division of the Temple was reproduced and perpetuated in the Christian Church, and it is known that it persisted in the west until a comparatively late date, whilst in the east it still forms an important adjunct to the ritual of the Armenian and Ethiopian churches. Durandus the monk, who wrote in the thirteenth century, has recorded that the use was maintained in his day, and he mentions that a veil or wall was the customary division, and this was prescribed in an Anglo-Saxon Pontifical from which he quotes. Elsewhere he alludes to a triple series of veils. St. Jerome is also recorded to have commanded the use of veils. The Anglo-Saxon Church always preserved very scrupulously an effective division between nave and sanctuary, and in some of our unspoilt early churches the solidity of the barrier is very marked, the chancel opening being extremely narrow. Several examples of these tympanums survive, bearing ancient paintings. The Last Judgment is the subject usually represented, and it would appear that the Crucifixion, as represented at Winsham, is unusual. The west side of the screen was assigned to subjects of this character for the following reason. The screen was symbolic of Death, the barrier between time and eternity, between the church militant and the church triumphant. Thus the terrors of death to the impenitent, and the consolations of the last hour of the just, were aptly exemplified by a conspicuous rendering of the Doom in this position, and the Rood with its attendant images crowning the screen, conveyed the teaching of the divine conquest of death, and the intercessory powers of the saints. On the east side of the tympanum the Resurrection was appropriately depicted, and nothing of a grotesque or evil nature is ever observed eastward of the screen. The Rood and attendant figures surmounting the screen were generally carved, and were occasionally attached to the painted panel behind them. Perhaps Winsham and St. Albans are the only instances which can be recorded of a painting of the Crucifixion upon the tympanum, and the latter has unfortunately perished, with the exception of the lower portion painted on panel-though a drawing is preserved in the library of the Society of Antiquaries of London.